Photos and narrative by Pat Hanrahan: the light dome off to the north before it expanded. The awakening: I was about to quit for the night and had already packed my camera away. But then Greg Babcock notified me that things had suddenly changed. Rays: at this point the aurora was quite active and the rays could easily be seen moving across the sky. Before some of the rays appeared, we could see a bright spot on the horizon that soon shot up into the sky. Brightest point. 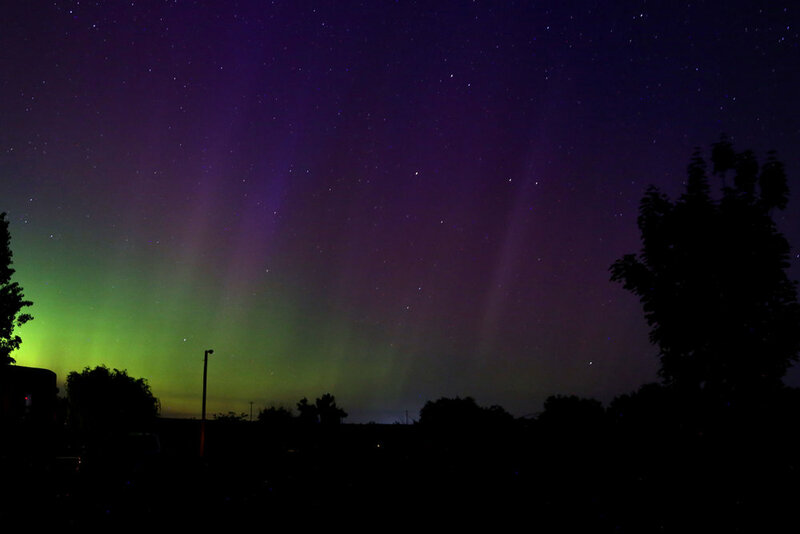 This unexpected auroral event was caused by the relatively minor Coronal Mass Ejection of May 23. When it arrived, it caused a geomagnetic storm that reached a rating of G3 (strong). 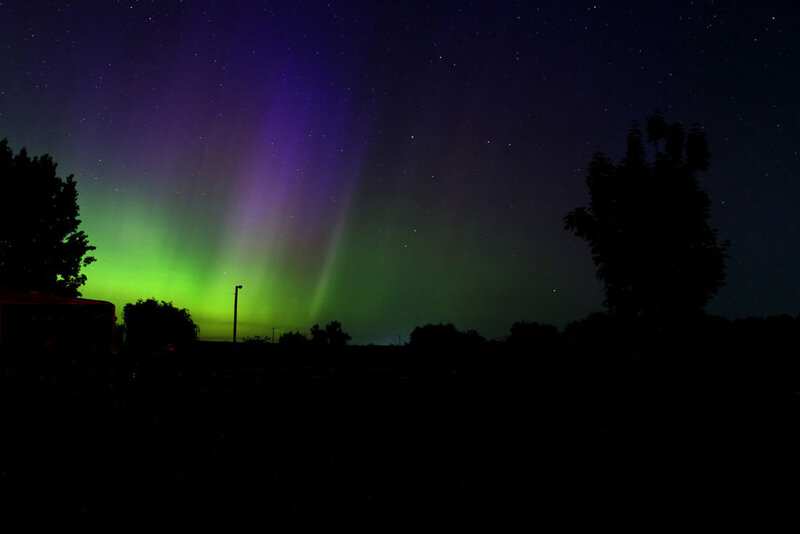 TheWeatherNetwork.com ranked the event as "The brightest and most intense auroras since 2015 were spotted over parts of Canada." For starters, I didn't quite realize how well Horn Rapids Campground is suited for astronomical observing. It's flat, grassy, easy to get to; has water, electricity, bathrooms and huge open areas. Enough for three hundred observers, to my eyes. As soon as we arrived, everyone took out their scopes and we had an excellent night of observing right from the start. The sky was clear from horizon to horizon, there was no moisture in the air, the sky was steady and transparent, so we had a great kick-off. Our potluck, on the other hand, perhaps should have had more planning. We had a large collection of desserts. The next day the buses arrived on time for our B Reactor Tour, which was most excellent. That night we moved up to LIGO for a star party we had planned with the local astronomy club. It turned out we could have just stayed at Horn Rapids, and several of us did. But LIGO allowed us to observe from a terrific location, so we had a friendly night. That was the night of the stunning aurora display. In the afternoon, there was also a grass fire nearby, thankfully on the other side of the river. The next day we had the LIGO tour, thanks to the valiant efforts of Amber, their public outreach co-ordinator, and we ended with a strawberry shortcake social on the lawn under the shady trees. About fifteen of us stayed for the third night, not willing to give up such a great place to observe. We left making plans to do this again next year. I can’t tell if that will happen, but for sure I know that we have now made a few new friends in a place with clear skies and almost perfect observing locations and I look forward to cultivating those friendships.